Everybody wants to look their best, but what do you do when an illness alters your skin and hair? This is a reality that many Americans face with Hypothyroidism. Hypothyroidism is a condition where the thyroid, a gland found in the neck, is unable to produce a sufficient amount of thyroid hormone. Hormones released by the thyroid regulate important bodily functions like breathing, sweating, heart rate, among others. If the thyroid produces too little of the hormone, an individual might experience fatigue, trouble sleeping, dry skin and hair, and more. When someone is treated for hypothyroidism, they can experience a significant change in the appearance of their skin. Some people notice that their skin becomes more dry or rough. Others will feel that their skin has become more yellow, thick, or swollen. Hyperthyroidism can also have a great impact on a person’s hair. The illness may cause hair to become drier and/or thinner, which can take its toll on an individual’s self-esteem. At City Pointe Beauty Academy, our staff of talented beauty professionals have the skills you need to return your skin and hair to its natural beauty. Our Customized Facials are designed with you in mind, so no matter how hypothyroidism is affecting your skin, we can help. Worried about hair thinning and damage? Our stylists can wash your fears away with our many deep-clean services to help strengthen your hair, as well as stylish haircuts that help you look and feel your best. Thyroid issues are not something you can control, but they also don’t have to hurt your self-image. We believe strongly that every person should love who they see in the mirror, and our stylists are ready to help you get there. 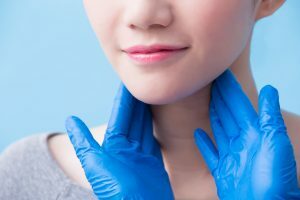 Hypothyroidism and other thyroid conditions affect 20 million Americans, but services exist to help with the symptoms and return your skin to its glowing state. Give the experts at City Pointe Beauty Academy a call today at 417-673-8828 or visit us online to see the dozens of services that our experts deliver.